Hot Tubs & Star Gazing…yeah, there’s an app for that! Purchase the Star Walk 2 app for your iPhone. Star Walk 2 is a star gazing app like no other. 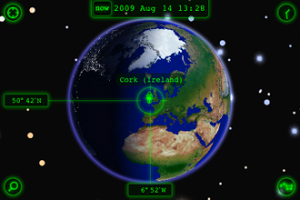 Not only can you learn the planets, stars and constellations, Star Walk adds in great features like location awareness. Using the location feature, Star Walk 2 can give a clearly labeled night sky letting you easily identify what you’re looking at. The app also makes use of the compass feature, if your model of the iPhone supports it, and brings up an exact night sky of your current location. Looking up constellations is just a matter of tapping on the star you want and voilà! Your constellation outline comes up on your iPhone. A feature which colors your whole screen dim red so as to preserve your night vision to gaze at the sky is just the perfect touch. Star Walk 2 is definitely worth the $2.99 it sells for.